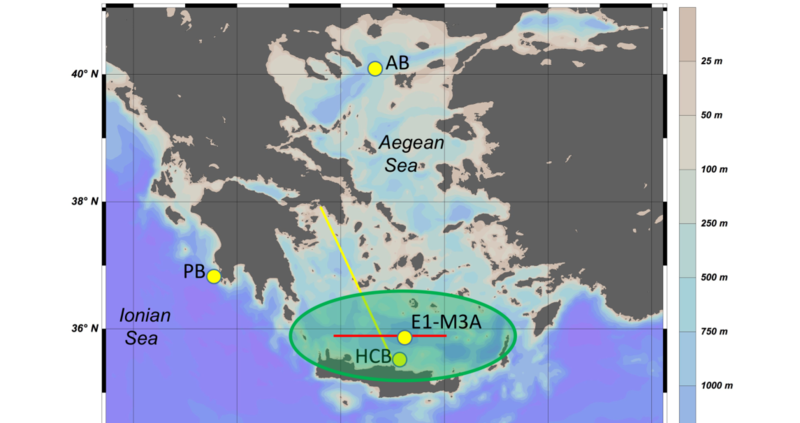 Scientists from the Hellenic Centre for Marine Research (HCMR) have recently produced two papers, published on the open access journal Ocean Science. The first one, titled “Acoustic Doppler current profiler observations of migration patterns of zooplankton in the Cretan Sea”, reports on the observation of the vertical migration of mesopelagic inhabitants (macroplanktonic and micronektonic) on a two-and-a-half year time span in the Cretan Sea. This vertical motion, which was found to be unaffected by the stratification of the water column, has important implications in biogeochemical processing in oligotrophic seas, especially regarding the presence of an active carbon and nutrient pathway from the surface to the deeper layers and vice versa. In the second paper – “An integrated open-coastal biogeochemistry, ecosystem and biodiversity observatory of the eastern Mediterranean – the Cretan Sea component of the POSEIDON system” -, the POSEIDON observing system is thoroughly described. The POSEIDON observing system adopts a multiplatform, multivariate approach, allowing to increase the spatiotemporal coverage of biogeochemical (BGC) data observation, thus improving the quality of BGC-ecosystem model predictions. That helps tackling open scientific questions both at regional and international scales, since the oligotrophic open Cretan Sea’s biogeochemistry is representative of a vast area of the Mediterranean Sea, which in turn is considered a miniature model of oceans.